December keeps moving along at record pace. My sewing to-do list seems to be growing and not shrinking. I need to purposefully slow it down a bit. I did manage to get most of the decorating done. It was quite the task locating the Christmas decorations in the multitude of moving boxes I have yet to unpack. If I think about the basement too long I get anxious so I will just focus on the pretty lights and colors and head back to my sewing room. Have a blessed day! Your Christmas decorations are very pretty and festive!! I have the same problem with a non shrinking Christmas list. Your decorations look so pretty Renee! My list is not shrinking either. 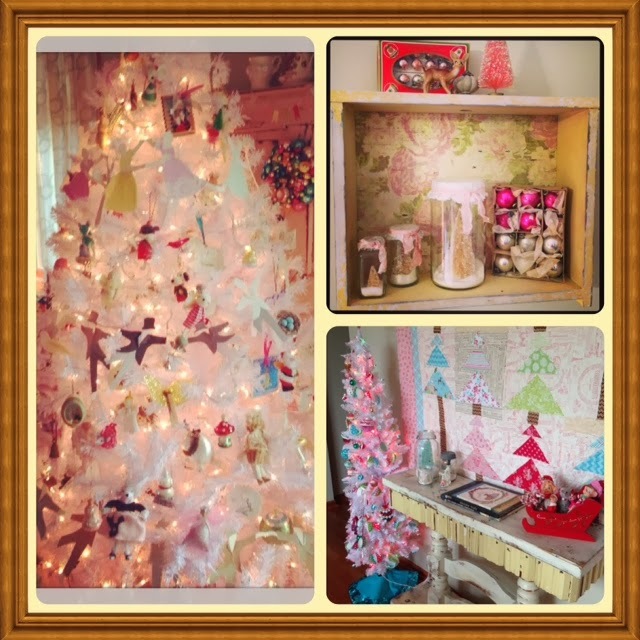 I love the pastels and there are the victorian skaters on your tree. So pretty! Your decorations are just beautiful. Very pretty! isn't it nice to have a place to escape to when some of the tasks before us seem just a bit overwhelming and you'd rather not face them? LOL I find that sewing is the perfect solitude for me when I want to have some down time.